On this day 14 June 1916: Uncle Jim Duperouzel from York, Western Australia arrived in Marseilles, France on board the troopship H.M.A.T. 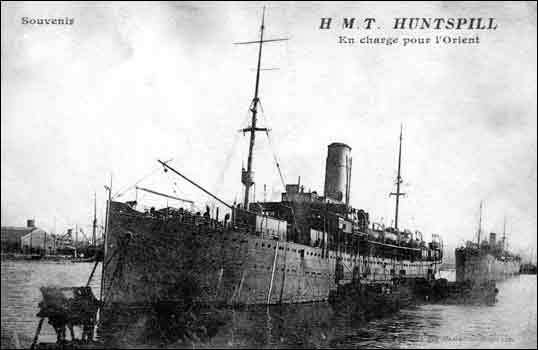 HUNTSPILL (pictured here courtesy of Transport of Delight) – a journey that took seven days from their training camp at Alexandria, Egypt. The troops of the 51st Bn. AIF then travelled for three days by train to Étaples, north west France, the location for the Australian 4th Division Base Depot. Within a few weeks they were in the trenches on the Western Front at Mouquet Farm, near Pozières where they experienced their first major engagement during the advance on Mouquet Farm on 14 August and 3 September when 311 servicemen died – 115 in August and 196 in September of whom 200 have no known grave and their names are inscribed on the wall of the Australian War Memorial at Villers-Bretonneux. Uncle Jim was killed in action on 14 / 16 August 1916 and he too is still missing. May they all rest in peace.